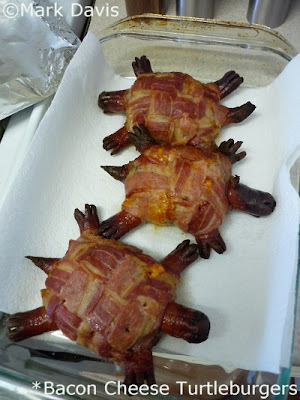 "Ground beef pattie topped with cheese, wrapped in a bacon weave shell, with hot dog for head, legs and tail." via This is why you're fat. Nate- what will they think of next. Saw this a few days ago and thought it was really neat. I bet they taste good and they make the food more entertaining. It's a win all around. Brad- very entertaining, but what kind of bun should be used, LOL. That's hilarious! Now...how much does one of those cost? honu burgers. I can see this catching on. Glennis- this'll be difficult to top even on the Internet. kahuku- we'll have to release them in the wild.